Is it possible for a beginner to learn the basic archery steps without the aid of an archery instructor or private archery coach? 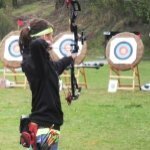 At Learn-Archery.com we understand that it is not practical or possible for everyone to join an archery club or receive ongoing archery lessons for a variety of reasons. Here you will learn archery for beginners and also for advance shooters to improve their skills. You will need more than a bulleted list of archery steps to learn the archery shot cycle! On other websites you only get a simple list of archery steps like the one below, but just knowing what the steps are called will not help you. We explain each step with real information and useful instruction. The entire process is explained in detail along with archery tips that help you learn how to perform the steps properly. Our goal is to provide you with straight forward explanations of the archery techniques that you can start using today so you can advance your skill beyond the beginning archery phase much sooner. AWSOME! Where do I start? Hold on...there is more to this than just knowing what the steps are called. You can not approach archery and be effective if you shoot in a series of static steps. You need to know how to practice the steps and then you need to know how to put it all together into a fluid Shot-Cycle. Before you dive into the individual steps, be sure to read the section below for some key points and tips that will help make your archery learning experience fun and productive. If you are anxious and just cannot wait to get started you can click any of the 10 basic archery steps below to learn more. I can get this same information any place...what makes Learn-Archery.com different? But they fail to tell you how to properly execute each of them. They also fail to tell you how to practice and develop your skill to the next level. At Learn-Archery.com you will get more than a description of the basic archery steps! We will walk you through each step and give you the same instruction that you would get if you were receiving archery lessons from a skilled instructor so you can quickly advance to the next level on your own. At the end of each basic archery step we will explain important information that you need in order to fully grasp and apply your new archery skills and techniques. We also know that you can search the web and find a number of variations that outline the basic archery steps. Its all so confusing - How many actual steps are there? I have to confess that I am mystified by the vast number of variations on the topic but I was really surprised when I stumbled across a website that claims there are only 4 steps to archery. Out of pure curiosity I actually paused long enough to read it...I have no further comments other than to say I wasted my time. How many basic archery steps are there? The answer is that it will depend greatly on who you are talking to AND their personal level of understanding. The real answer is that there are 10 basic archery steps for beginners. Let me reiterate - There are only 10 steps that a beginner archer should be concerned with. Master these ten basic steps first! When you are comfortable with your understanding and you can properly execute the entire archery shot cycle for beginners then it is time to turn to the advanced archery steps. OK - But I don't have an instructor or an archery coach to help me! At Learn-Archery.com we go beyond what anyone else can provide for on-line archery instruction. We will explain how to manage each of your practice sessions so your experience is productive, meaningful and highly effective. 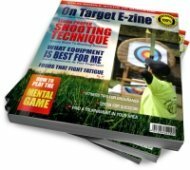 Here you will find all of the tools you need to make each of your practice sessions a success so you can quickly grasp the basic archery techniques. It is like having your own personal archery coach who will help you quickly transition from a beginning archer and into the exciting world of advanced archery. Knowing what the archery steps are is a good starting point but how do I become a proficient and skilled archer? Knowing the basic archery steps is not enough and this is where the other archery websites fail - They simply state what the step is but they don't explain how to perform the task or technique. After you have learned the individual steps you need to put it all together into a shot sequence. In archery we call this the Shot Cycle and you can learn how to turn the basic archery steps into a winning sequence right here. The section on the Basic Archery Shot Cycle will help you tie all of the basic steps together so your sequence is a well-planned, harmonious cycle that is gracefully executed. When you understand how to apply the Basic Archery Shot Cycle you will become much more consistent and accurate in your shooting skill and you can shoot longer with less fatigue. Most people who are new to archery do not take a systematic approach to the learning process. Nock an arrow, pull the bowstring back, point the arrow down range at an object then release the arrow. Unfortunately I have also observed many certified archery instructors who take the same haphazard approach to teaching new archery students, which is very disappointing for the student to say the least. You see? These "would-be" archery enthusiasts are being cheated out of a quality learning experience. The Archery Shot Cycle is a complex sequence that requires the development of new muscle and motor skill if it is to be performed correctly. If you acknowledge this one simple fact right up front, you are likely to be a successful self-taught archer in a shorter time. Only then do they realize the physical and mental control that is necessary to be consistent and effective. 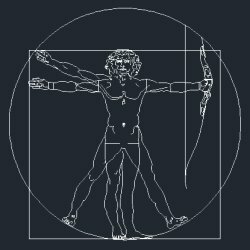 In the Basic Archery Shot Cycle learning section I explain the biomechanical, physical and mental process of archery and how to overcome any challenges that you may be up against. The approach that I use for teaching basic archery shooting technique to new students is much the same as teaching advanced competitive archers. The real difference between working with an advanced athlete and a new archery student is the depth of content, the number of repetitions, the amount of time and the frequency of exposure necessary to develop the new skill. Secondly the archer will perform extra physical activity that is specific to archery to increase strength and endurance so we can minimize the risk of injury during day long tournaments. Last, the archer moves in to the role of a true athlete when I introduce them to the mental training phase that gets them in the game and keeps them focused through the very last shot cycle. High performance competitive archery is both physically and mentally demanding and Learn-Archery.com is your channel to greater precision, higher scores and the winners circle. Anyone can shoot a bow and arrow - Why so technical? But we are not interested in random moments of success. These pages are not written for the haphazard or the lucky. Learn-Archery.com is for those who wish to take their basic archery skill to the next level. The sport of Archery is all about repetitive consistency and accuracy. For all for all intents and purposes I assume that you are practicing on a safe range with a "Shooting Line". The Shooting Line is an important component on every archery range that provides a visual reference for both the instructor and the student. If your shooting range or lane does not have a shooting line then please assume an imaginary line that is placed parallel to the target face. Safety Equipment (armguard, finger tab or release mechanism) should be used at all times to prevent injury. Have A Question About Basic Archery Information?